The NSA’s covert eavesdropping operations give it an insight into the Japanese government’s private negotiations and dealmaking. As was the case in late May 2007, during a secret meeting at the luxury Hotel Captain Cook in downtown Anchorage, Alaska. 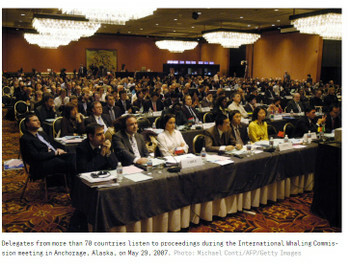 The 59th annual gathering of the International Whaling Commission was being held in the hotel — and Japan was lobbying to end a moratorium preventing countries from hunting whales for commercial purposes. U.S. officials supported maintaining the moratorium and called in the NSA to help spy on Japan’s representatives ahead of a crucial vote. The agency worked with its New Zealand counterparts to conduct the surveillance. “New Zealand had the target access, and collected and provided insightful SIGINT that laid out the lobbying efforts of the Japanese and the response of countries whose votes were so coveted,” noted an NSA document from July 2007, which outlined the operation. One morning into the four-day gathering, at 7 a.m., an NSA employee arrived in a taxi at the agency’s Alaska Mission Operations Center, a 20-minute drive from the hotel. She collected printed copies of the intelligence that had been gathered from the Japanese communications. She then returned to the hotel with the information stored in a locked bag, and brought it to a private conference room in the hotel. There, the material was shared with two U.S. delegates from the Department of Commerce, two officials from the State Department, two representatives from New Zealand, and one from Australia. The officials read the material in silence, pointing and nodding while they studied it. The 77-member commission voted at the meeting to allow aboriginal whaling for indigenous people in the U.S., Russia, and Greenland. Japan put forward a proposal that it should be permitted to hunt minke whales for similar reasons, claiming that doing so has been part of its culture for thousands of years. But it failed in its efforts; at the end of proceedings in Anchorage, the moratorium stood and Japan was not granted any special exemptions.